Any good yogurt bar starts with the good stuff. 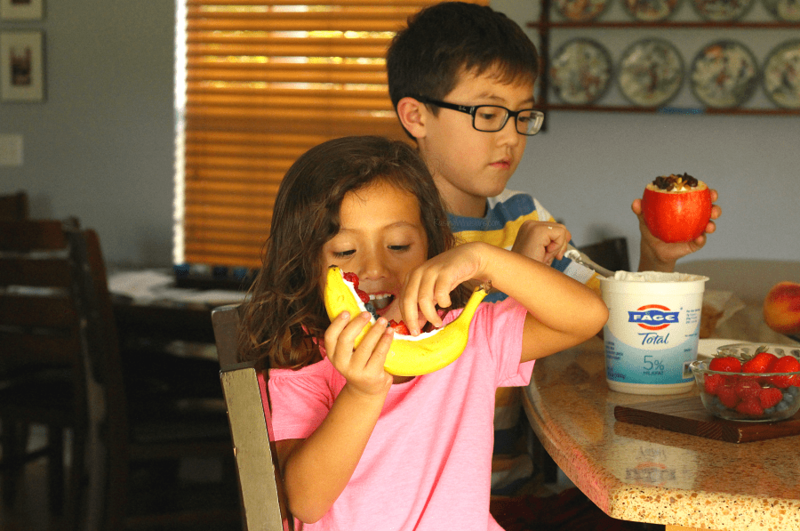 FAGE Total 5% Plain Greek Yogurt is the perfect yogurt choice for our family. This protein rich yogurt has no added sugar and is additive and preservative free, gluten-free and Non-GMO Project Verified. 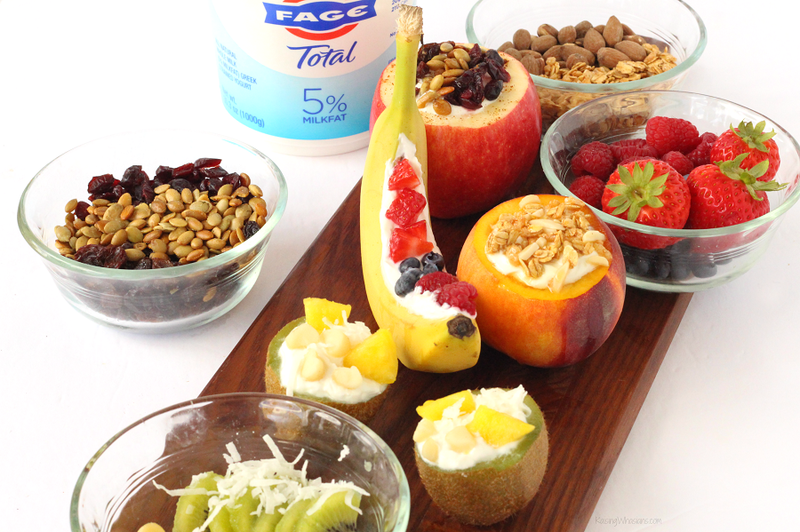 All natural and a good source of calcium too, I love how FAGE Total yogurt is satisfies my kids’ snack cravings, all with a creamy texture. It’s the perfect foundation for our unique fruit bowls and yogurt bar! And speaking of yogurt bar and unique fruit bowls, who’s ready to kick up the after-school snacking to level 11?! 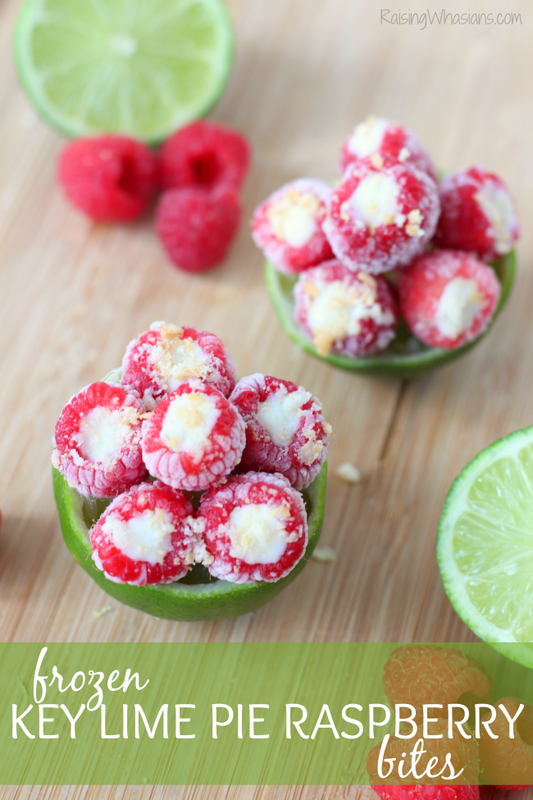 With fall around the corner, I am loving the flavor combo of this fruit bowl. 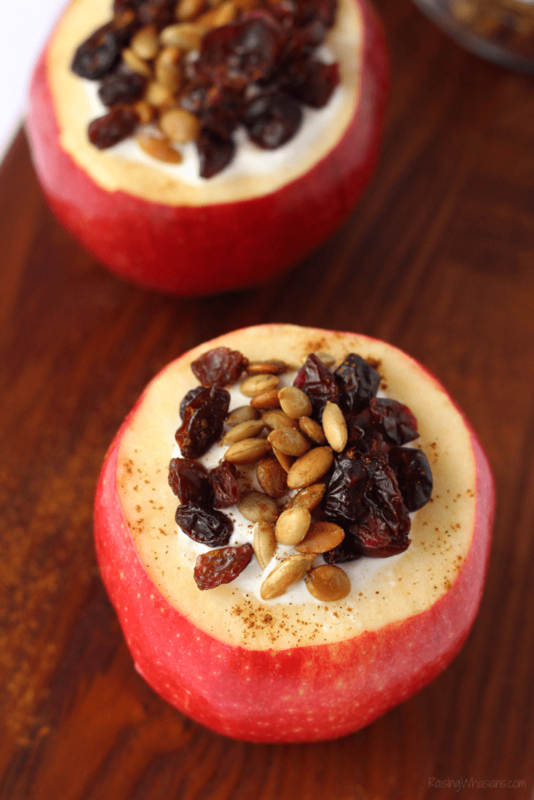 Hollow out your favorite sweet apple. 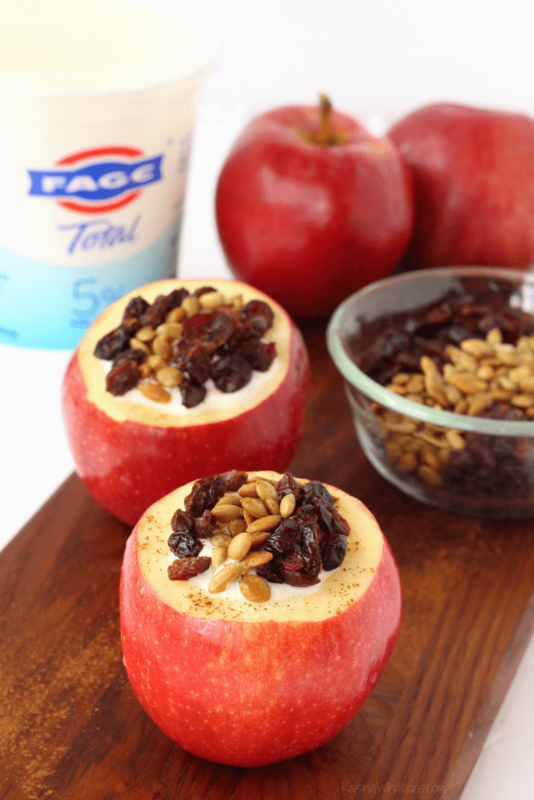 Then add FAGE Total yogurt topped with dried cranberries, raisins, pumpkin seeds and a hint of cinnamon – it’s tastes like a cozy fall treat. 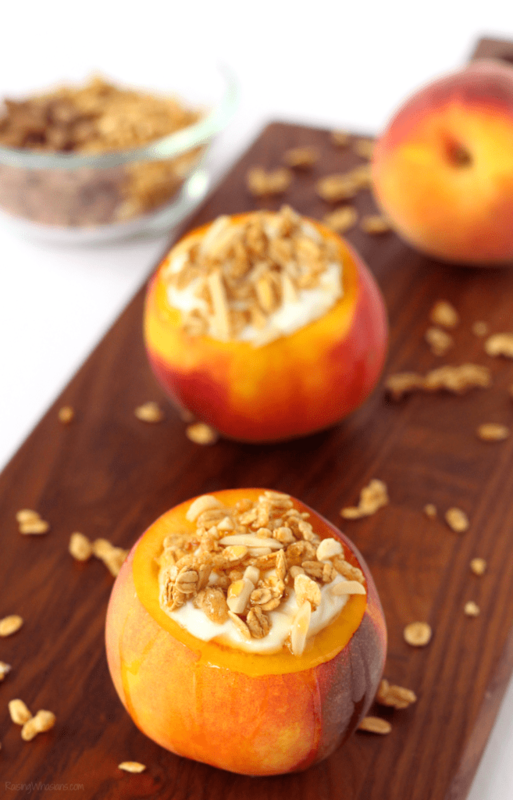 Who else loves peach crisp for dessert? 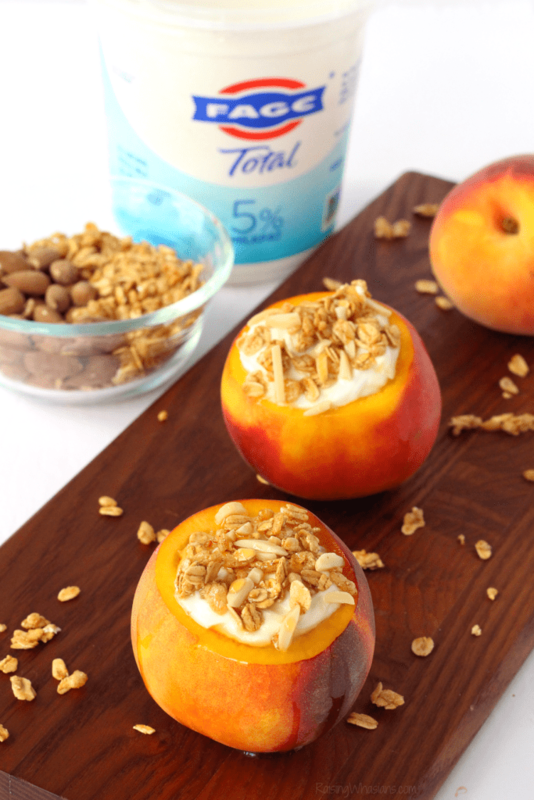 Fill your hollowed out peach with FAGE Total yogurt and top with granola, slivered almonds and a drizzle of honey. 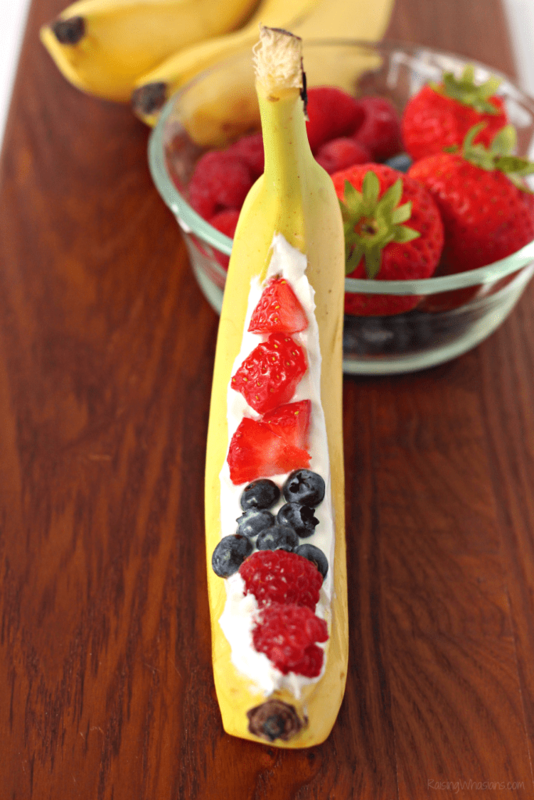 Did you know that bananas are berries? 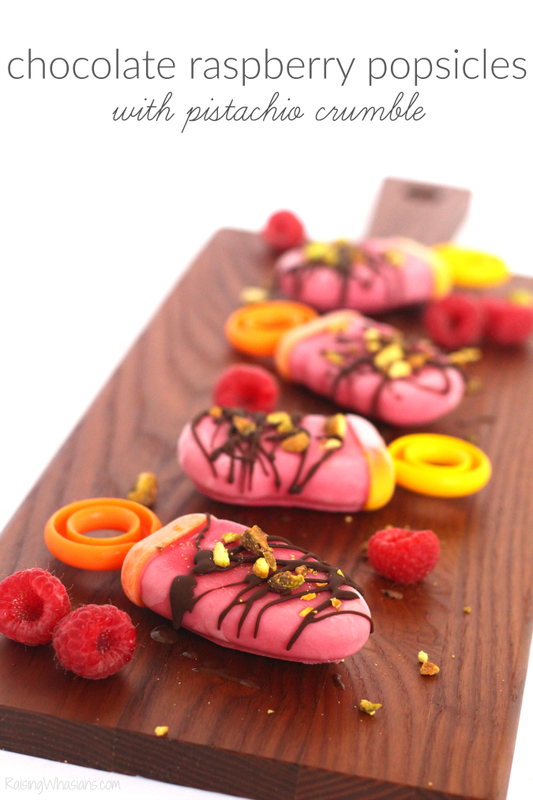 Wow your kids with your berry knowledge and this crazy berry inspired fruit bowl! 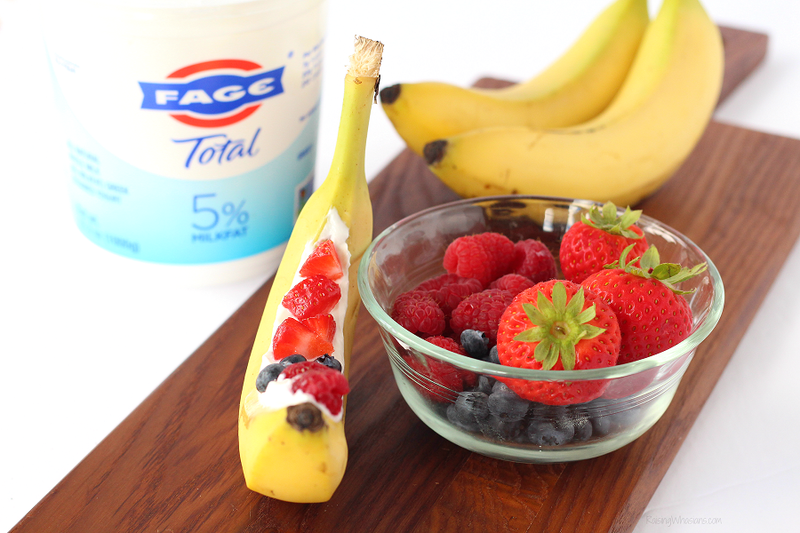 Hollow out a banana and top your FAGE Total yogurt with fresh strawberries, blueberries, raspberries. The options are endless when you’re inspired by the islands! 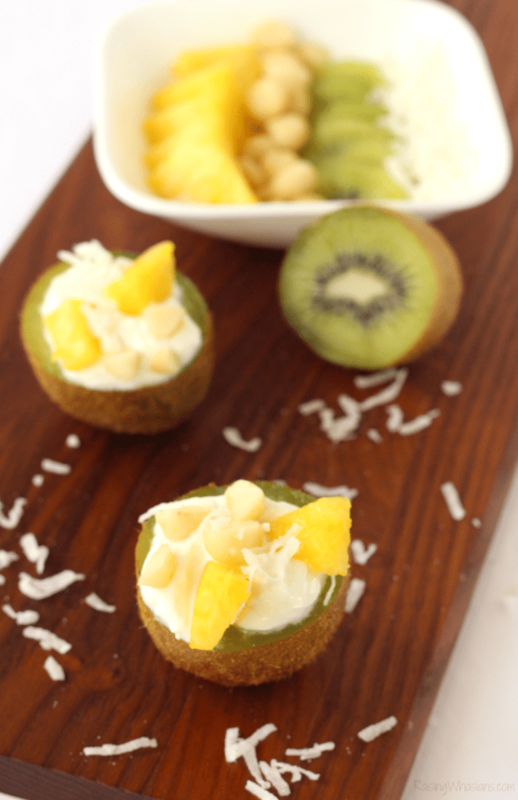 A hollowed out kiwi makes the perfect sized snack bowl for little hands. 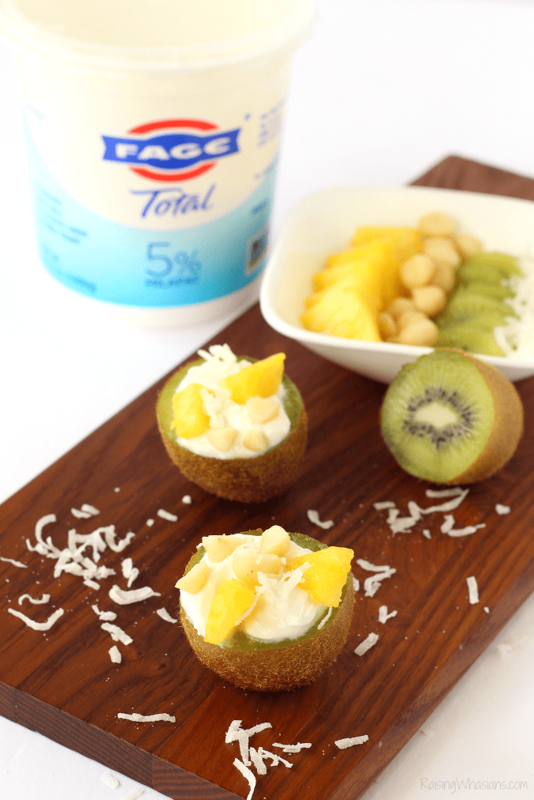 Top your FAGE Total yogurt with pineapple, coconut flakes and a few macadamia nuts for a taste of the tropics. After-school snacks taste so much better when you have your own custom fruit bowl, am I right? 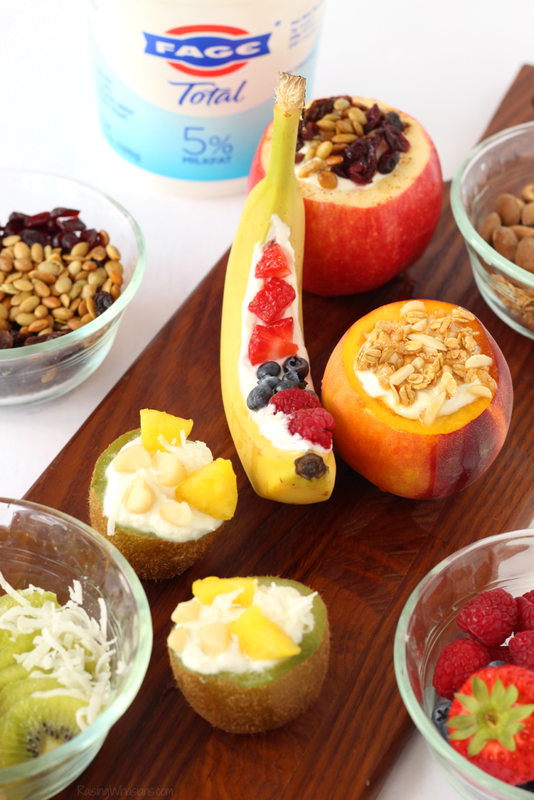 So grab one of these unique fruit bowls and fill them up with healthy toppings in the ultimate kid-friendly yogurt bar. 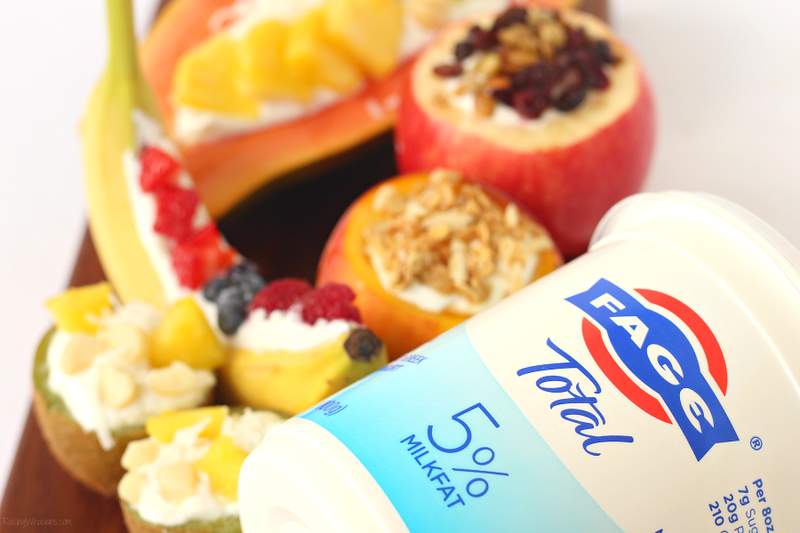 And don’t forget to pick up FAGE Total 5% Plain Greek Yogurt at your closest FAGE retailer too! Bonus, you won’t have to wash any bowls when you’re done. Which of these unique fruit bowls would your kids love to eat out of first? 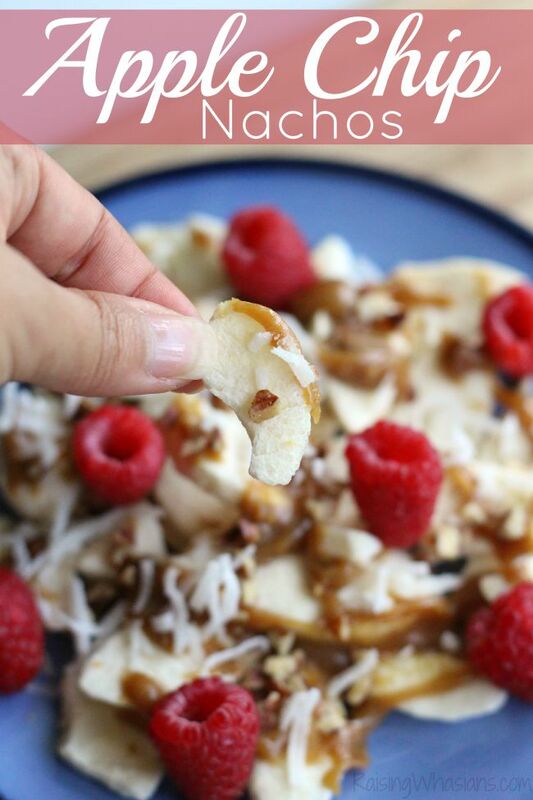 Be sure to follow Raising Whasians via Facebook, Twitter, Google, Instagram, Pinterest and YouTube for more delicious kid-friendly recipes, parenting ideas, kid crafts and family travel trips.